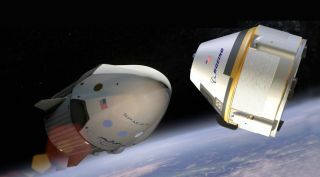 NASA, SpaceX and Boeing expect test flights of their Crew Dragon and CST-100 Starliner vehicles to take place next year after extensive delays. WASHINGTON — Both NASA and the two companies developing commercial crew vehicles say those efforts remain on schedule for test flights that are in some cases less than a year away. NASA published July 20 what it called "the most recent publicly-releasable dates" of the test flights of Boeing's CST-100 Starliner and SpaceX's Crew Dragon vehicles. Each company, under terms of Commercial Crew Transportation Capability (CCtCap) contracts awarded in September 2014, are required to first fly an uncrewed test flight of their spacecraft, followed by one with astronauts on board. The latest SpaceX schedule calls for an uncrewed test flight in February 2018, followed by a crewed test flight in June 2018. Boeing's schedule anticipates an uncrewed test flight in June 2018 and a crewed test flight in August 2018. Those scheduled have slipped considerably from the original CCtCap announcement. At that time, NASA expected both vehicles to have completed their test flights and be certified for regular crew transportation missions to the International Space Station by the end of 2017. Both companies have suffered technical problems that have pushed back those flights, in some cases by more than a year. A leading NASA official, though, sounded more confident about the companies' efforts towards those 2018 test flights. "Commercial crew is making great progress," said Kirk Shireman, ISS program manager, in a July 18 speech at the ISS Research and Development Conference here. "By the next ISS R&D Conference, I expect to have flown the first Boeing CST-100 Starliner and SpaceX Crew Dragon flight," he said. The 2018 conference is scheduled for late July in San Francisco. In an on-stage interview with Shireman at the conference July 19, SpaceX Chief Executive Elon Musk also expressed confidence his company's schedule. "Our primary focus will be on, particularly over the next year or so, our Dragon 2 spacecraft," he said, using the company's name for what NASA calls Crew Dragon. "What's our primary focus? Making sure we stay on track for getting crew to station, as we promised NASA, around the middle of next year," he said. "That's going to be real exciting." Musk acknowledged that developing the Crew Dragon spacecraft has been "way more difficult" than the cargo version of Dragon currently flying. "As soon as people enter the picture, it's really a giant step up in making sure things go right," he said. "The oversight from NASA is much tougher." "We have some debates going into next year about some of the technical details," he said of SpaceX's relationship with NASA. However, he later described those debates as minor "technical bones of contention" on unspecified "esoteric" issues. Boeing is also confident in its ability to maintain its schedule. "We are in the middle of a very aggressive test program," said Chris Ferguson, director of Starliner crew and mission systems at Boeing, during a July 20 panel session at the conference. Prior to the flight tests, he said, is a pad abort test planned for early 2018 at White Sands, New Mexico, as well as ongoing parachute and drop tests. Ferguson, in his presentation, said the flight test program would run from June through December of 2018, followed by NASA certification, and in an interview earlier in the day said those launches would take place in the "latter part of next year." He clarified, though, that the schedule of June and August test flights remains in place. "Our schedule hasn't changed from June," he said in the interview. "That said, we've got challenges we've got to deal with and we'll let the schedule fall out where it will." Boeing may offer more clarity about that test flight schedule in the near future. Ferguson said that United Launch Alliance, who will launch the CST-100 on Atlas 5 rockets, requires a "non-handshake type of agreement" about 12 months before launch. "If there's going to be movement, of which there's been nothing planned yet, it's going have to occur soon just to keep it consistent with what ULA wants," he said. Another upcoming milestone is the selection of a NASA astronaut to fly on the crewed flight test along with a Boeing test pilot. "Traditionally it's been about [launch] minus 12 months," he said of prior crew selections. "I think what they would like to do is have some schedule assurance before they go ahead and assign crews. Once they feel comfortable that they're about 12 months out from a crewed flight launch, I think you can see an assignment come out." Ferguson said the first operational, or post-certification mission (PCM) for the CST-100 could fly as soon as next December, but that schedule is dependent on both the vehicle's development as well as ISS needs. "I think the next crewed mission to be assigned would launch in May of 2019," he said. "We're keeping a close eye on that. NASA has a void they'd like to fill there. We'd like to be there to fill it for them."